Canada has the highest rate of naturalization in the world. 85% of eligible permanent residents become Canadian citizens. After you've immigrated to Canada and been a permanent resident for a bare minimum of three years, and you meet the language and residence requirements, you can apply to become a Canadian citizen. The processing time for Canadian citizenship applications has been around 24 months since 2011. This means that 80% of routine applications are processed within this time. However, with upcoming changes to the citizenship application process, the application processing time is expected to reduce to around 6 - 12 months. Please note that a child applying on their saves most of the government fee. If you are missing either your PR card or your IMM1000 document, you can still apply for citizenship as long as you have one of them. But, you have to include a letter explaining why you do not have the document. All Canadian citizenship applications need to include two photos. To apply for Canadian citizenship, an applicant must have been physically present in Canada for at least 1,095 days out of the last 5 years. Additionally, all applicants must have filed income tax returns and complied with all requirements thereof for3 years out of the 5 prior to applying. As part of the application, you have to declare the dates that you have spent inside Canada either on the Online Residence Calculator or How to Calculate Residence form. The residence requirement for Canadian citizenship does not apply to minors under age 18 who apply for citizenship at the same time as their parents. If IRCC determines that there may be doubt whether you have met the residence requirement for Canadian citizenship, they may give you a Residence Questionnaire. In the RQ, the applicant is expected to provide evidence that they have met the residence requirement by proving that they have been physically present in Canada for three out of the past five years. If you receive an RQ, this is now part of your application for Canadian citizenship and the application will not be finished until you submit the RQ. If you do not submit the Residence Questionnaire, your application for Canadian citizenship will be abandoned. Receiving an RQ will add a minimum of 6 months of processing time to your citizenship application. For more information about the RQ, see our Residence Questionnaire page, and our article, Reasons You May Receive a Residence Questionnaire. 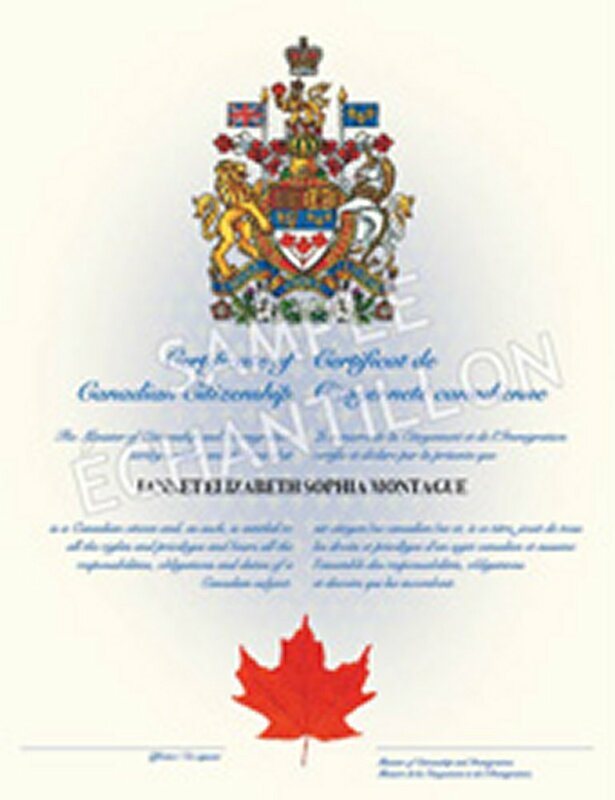 As of October 2012, IRCC has required that applicants for Canadian citizenship demonstrate that they can speak English or French proficiently enough to function in Canadian society. 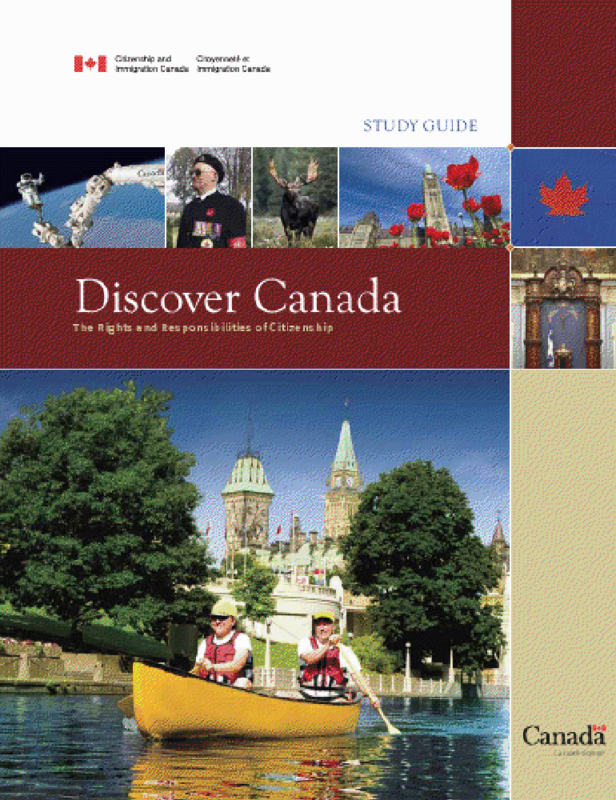 For more information about the language requirement, see our article Canadian Citizenship Language Requirement. Applicants for Canadian citizenship who are 14 to 54 years old must all take a test to demonstrate that they have knowledge of Canadian culture, laws, and government. The citizenship test is multiple choice with 20 questions, and you have to answer 15 our of 20 questions correctly. You will be told if you have passed or failed the citizenship test immediately after you turn in your answer sheet. If you failed the test, you will be scheduled to retake the test within the next six months. If you pass the test, you will be scheduled to take the oath of citizenship within the next few months. If you fail the test again, you will be scheduled to meet with a citizenship judge who will determine if you should receive Canadian citizenship at this time. It currently takes around two years to get a meeting with a citizenship judge. All applications for Canadian citizenship are submitted to the IRCC office in Sydney, NS. After your application is checked to make sure it is complete for processing, it is then forwarded to the IRCC office closest to where you live. From here, background checks are conducted on the applicant. Then, the applicant is scheduled for their Canadian citizenship test at this local office, unless they are exempt from the test due to age or medical reasons. Finally, the applicant is scheduled to take the oath of Canadian citizenship at this local IRCC office. If the applicant receives a residence questionnaire, this documentation will be reviewed at the local office where their file is held. When your Canadian citizenship application has been approved, you are then scheduled to take the oath of Canadian citizenship at your local IRCC office. Most offices have three or four citizenship ceremonies per day. Before the ceremony, you have to relinquish your PR card if you have one to IRCC staff and show them your IMM1000 Record of Landing, because you cannot hold a PR card when you are a Canadian citizen. 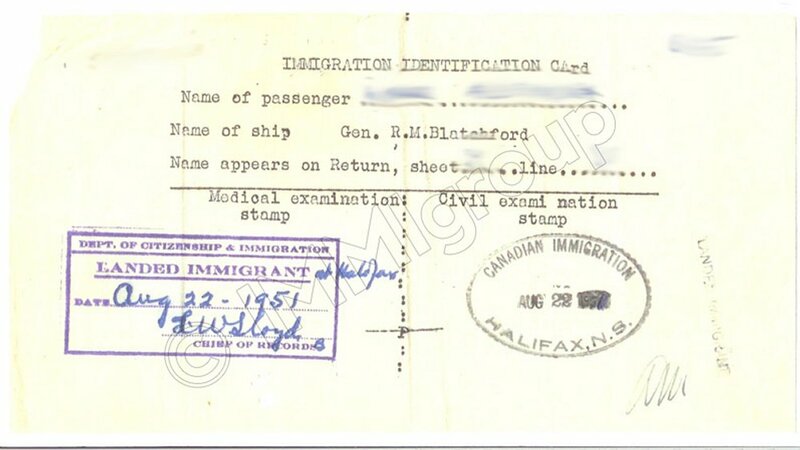 However, you do keep your Record of Landing as proof of when you first immigrated to Canada. Each applicant is allowed to have one family member or friend watch them take the oath. If there is room, additional guests will be allowed to watch the ceremony. During the ceremony, each applicant must recite the oath of Canadian citizenship in both English and French, repeating each phrase after the citizenship judge or IRCC official. Then, everyone sings the Canadian national anthem, O Canada, together. Finally, each applicant is called individually to the front of the room to receive their Canadian citizenship certificate from the judge. 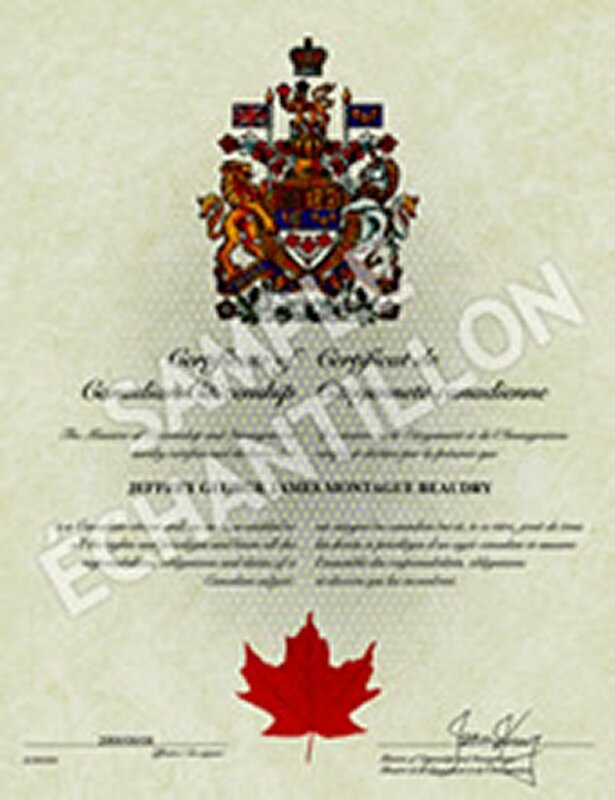 When the applicant has received his or her certificate, they then sign a declaration stating that they have not received Canadian citizenship under false pretences by lying on their application (misrepresentation), and that they are not currently under any criminal charges or convictions which would prevent them from becoming a Canadian citizen. When an application is filed for a child to become a Canadian citizen, several additional requirements must be met. One of the child's parents must be a Canadian citizen at the time the application is filed, or must also be applying for Canadian citizenship at the same time. This is to prevent a child from becoming a Canadian citizen while neither of their parents is. 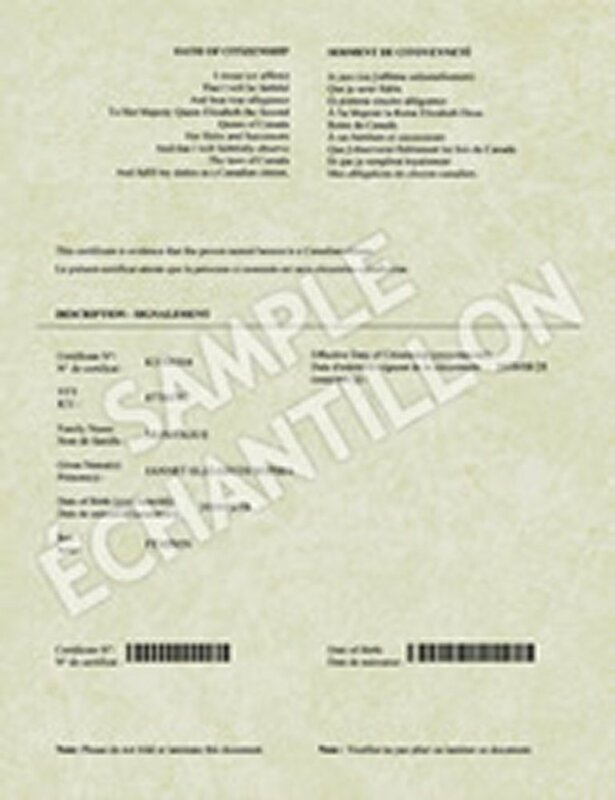 If one of the child's parents is a Canadian citizen already, a copy of the front and back of this parent's Canadian citizenship certificate should be included with the application. A copy of the child's long-form birth certificate should also be included which shows the parents' names. School records for the past five years for the applicant also have to be included with the application. A child under 18 years old also does not need to take the oath of Canadian citizenship, meet the language requirement, or take the Canadian citizenship test. Finally, a minor applicant does not need to meet the residence requirement of living three out of the past five years in Canada - they are exempt from this rule. Do you meet the residence requirement? Have you lost your Canadian Citizenship Card? Click here to replace it.